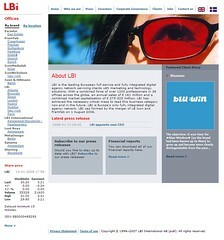 LBi is the leading international full service digital agency, servicing clients with marketing and technology solutions. The Company employs approx. 1,500 professionals located primarily in the major European and American business centers, such as Amsterdam, Atlanta, Berlin, Brussels, Copenhagen, London, Madrid, Milan, Mumbai, Munich, New York, Paris and Stockholm. Through interdisciplinary teams, LBi creates innovative multi-channel solutions for its national and international corporate clients by uniquely combining strategy development and creative design with specific industry expertise and latest digital technology. LBi is listed on Euronext in Amsterdam as well as on the OMX Nordic Midcap segment in Stockholm (symbol: LBI).